Set in the second world war in Lithuania, Yael is a young Jewish woman who happens to be outside her village when all the Jewish people are crowded together and shot in a mass grave. She doesn’t know where her brother is and is certain her parents have been killed. She wanders the woods with an old woman, Rivka, who dies of exposure. What will she do now? Where will she shelter? How will she ever find her brother again? How can a world so torn apart be salvaged? She finds shelter in the farm of the local mute, Aleksei, someone they had always assumed was a madman. Miraculously, after a few days of living in his chicken coop, he welcomes her into his home and a strange new life filled with literature and hope begins. For though Aleksei is mute, he has an affinity for language. Whenever he isn’t working the farm, he’s reading from his large library of mostly Russian literature, works in Russian and Polish, translations of French poetry and Shakespeare. Yael and Aleksei start to share this quiet life together. A life in which the seasons and the land continue regardless of war. But this is World War II and any safety for a Jew living in Lithuania is illusory. Yael has other burdens yet to bear, other hardships to face in the coming months. The Song of the Stork is one of those gentle books that works its quiet way into the pathways of the mind. There is a calm exactitude to the writing. Though there are brutal moments – how could there not be given the novel’s setting? – this is mostly a book about the indefatigable march of survival and the importance of words and stories to help you through. Before Yael is forced to leave Aleksei, she takes pleasure in a stork that settles on the farm; a returning visitor despite the war, she and Aleksei watch the stork build its nest, bringing spring upon its tail as the saying foretells. The stork becomes a beautiful symbol working throughout the narrative. Not only is it a symbol of hope for Jews as it flies to Palestine, the stork reminds her of her father who first told her that storks were mute just like Aleksei. Yael’s father used to call her ‘my little stork’. As the novel progresses her own little stork begins to grow and it becomes clear that song and poetry don’t have to be loud to make themselves heard. This balance between speaking and silence, the written and spoken word, the quiet of contemplation and the fearful game of hiding, waiting, silence and sudden noise of war works through the whole novel. The novel is the song the stork cannot himself sing aloud. 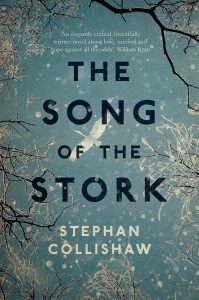 There are many books written about this period, but The Song of the Stork doesn’t feel trite, it feels relevant to our world in which people are judged by their beliefs and their heritage when we all deserve the right to food and shelter, to a life full of human connection and warmth. 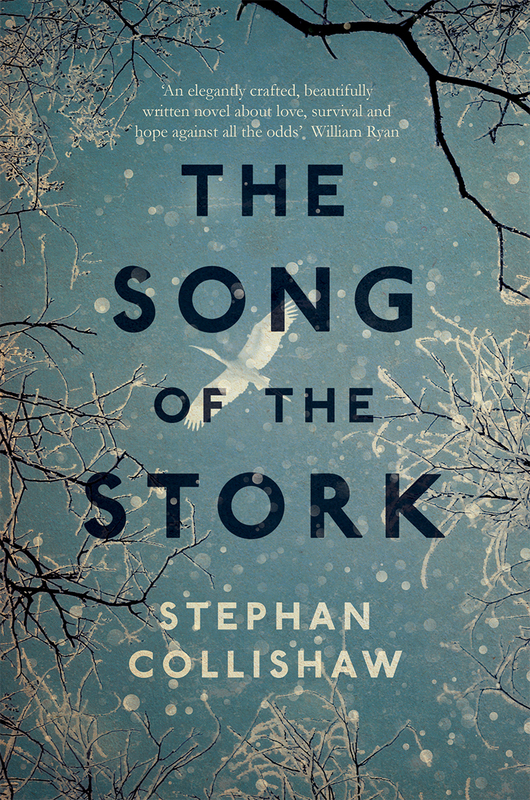 If you are looking for a novel of poignancy and provocation, The Song of the Stork is for you. I’m delighted to be part of the blog tour for The Song of the Stork, published 1st March 2017 by Legend Press. Further details about the novel and where to buy it can be found here. This entry was posted in The Blog and tagged Blog Tour, Legend Press, Stephan Collishaw by admin. Bookmark the permalink.